Looking for cool and casual space in the heart of East Austin? With multiple spaces, configurations, and (of course!) coffee, beer and tacos to die for, Lazarus is the ideal venue for your next event. Whether you're planning a corporate happy hour, wedding reception, or just celebrating life, we've got you covered. Thirsty for more? Click here for a virtual tour. Ready to reserve? Click here for availability and rates. Hosting a private party? 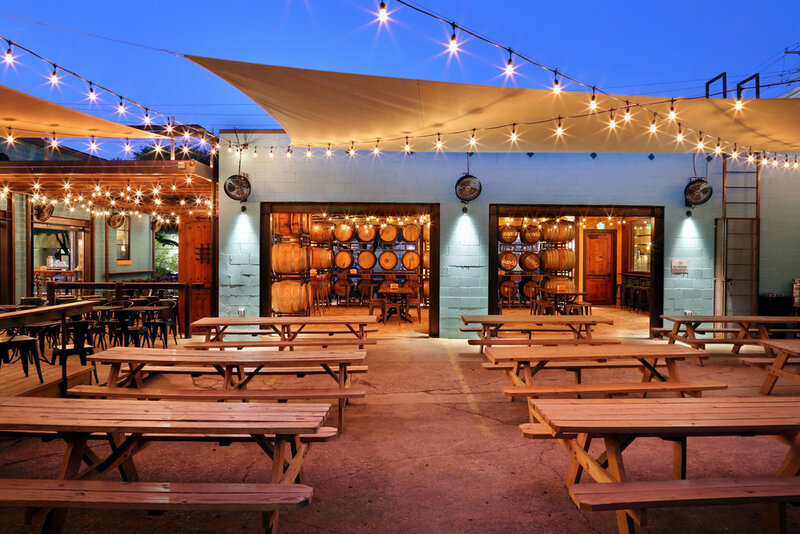 Our cozy and intimate barrel room is the perfect setting for rehearsal dinners, board meetings, sales presentations, and corporate team happy hours. Seat up to 50 guests inside, or slide open the glass garage doors and spill out onto on our stained glass or picnic patios to accommodate up to 120 additional guests in open air seating. Need more space? If your party is too hopping for the Cool Store alone, or if you're just feeling al fresco vibes, consider spilling out onto our Stained Glass patio. Topped with glowing, candy colored glass, our stained glass patio is the perfect compliment to the Cool Store. What goes better with beer than a side of sunshine & starlight? Our open-air picnic patio is the perfect spot for corporate happy hours, wedding receptions, and larger celebrations of all stripes. With seating for 130+ the sky is, quite literally, the limit for your next event.